Consistently one of my favorite artists, Willemark is a musician with few peers, equally at home in very traditional folk music and the most avant garde jazz. Folklorist, composer, violinist, vocalist; all of these parts make a sum that is really pretty incomparable in the musical world. I am pleased to carry a number of recordings by Lena, as a solo artist and in concert with both folk and jazz musicians from Sweden. Lena Willemark has in her musical character two different sources of energy. From her native village Evertsberg in Dalarna she has inherited delightful, wilfull songs and ballads, which she holds in trust as a fiddler and, above all, as the most famous folk-singer in Sweden. In Stockholm, at the late 70's, she was confronted with jazz. It turned out to be a fruitful meeting which led her to new ways in musical and composing work and created inspiring collaboration with musicians within jazz and improvisation music. 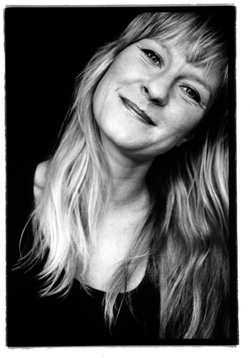 These two sources of energy has led her to work together with groups such as Frifot, Enteli, Elise Einarsdotter and to cooperations with the composer Karin Rehnqvist. The recording projects called Nordan together with Ale Möller has set new musical storms free both in Sweden and abroad. They received both the Swedish Grammis in Folkmusic 1994 and Preis der Deutschen Schallplattenkritik 1994. Her next recording, produced by ECM, will be in September together with the group Frifot. LENA WILLEMARK performs frequently both on radio and TV. On the 21st of November the first performance of Lenas own composition work "Windogur", a work commissioned by Stockholm - the Cultural Capital of Europe 98, took place. She performed together with Bobo Stenson, Palle Danielsson, Lisbeth Diers, Staffan Larson, Mikael Marin och Mats Olofsson. The concert was part of a series of concerts called "Ladies Next".